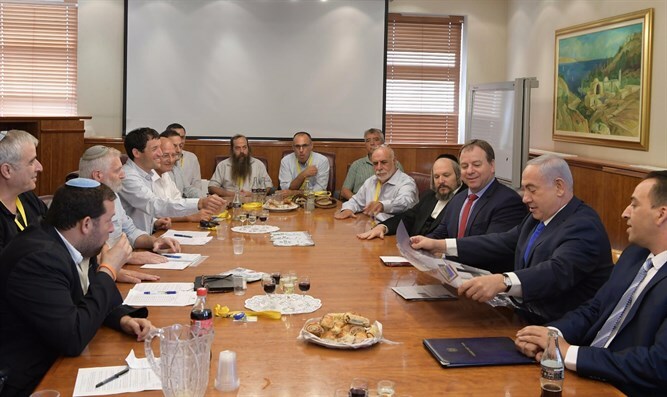 Event honoring PM by the Binyamin Regional Council postponed amid unrest over award after destruction of Netiv Ha'avot homes. Prime Minister Binyamin Netanyahu will not receive the 'Friend of the Settlements' award from the head of the Binyamin Regional Council, Avi Roeh, on Thursday, it was revealed Tuesday. Roeh planned to hold a festive event and give him the badge of appreciation after a tour of Binyamin. However, a message was sent Tuesday afternoon stating that the event would not take place and would be postponed to an "unknown date." Arutz Sheva has learned that the award of recognition to the prime minister provoked unrest among key Likud activists, some of whom were invited to the event, as well as among various elements in the settlement. Most of the rage stemmed from the proximity to the eviction and demolition of houses in Netiv Ha'avot while at the same time the Supreme Court's decisions to demolish illegally constructed Arab structures in Area C is not being carried out. A source in the Likud added that there is great anger at what he calls "the dragging of feet in the matter of the establishment of the settlement committee." "It is inconceivable that a person will be entitled to the title of 'Friend of the Settlements' and that for 13 months there is no cabinet decision that the prime minister himself has initiated to legalize the settlements. After the legalization has begun, then it would be possible to hand out prizes," the source added. The Binyamin Regional Council confirmed that Netanyahu's visit and the ceremony of awarding the letter were rejected.